I just got a chance to watch the recording of Anthony Bourdain's No Reservations Singapore Episode last week. As usual, Bourdain visits nondescript, hidden, non-touristy places which are frequented by the locals with the sole goal to enjoy good food. For the Singapore episode, I'm glad to know that I too had known and love some of the places he visited, such as Maxwell Food Centre and Golden Mile Baharudeen Soup Tulang. I think the local fixer (was it Seetoh from Makansutra?) did a great job because he was able to paint realistic image of the daily lives and peculiarities of Singaporeans (except for the segment in Aurum restaurant). One segment of the show was seafood, which I love! For this one, Bourdain visited a place that we didn't know had existed: Tian Jin Hai Seafood. 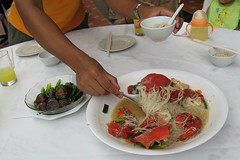 In the show, Bourdain and Seetoh ordered Chili Crab and Steamed Shark Head. Both seemed so much mouth-watering that I wanted to eat the TV. It was decided: I needed to try Tian Jin Hai seafood before going back to Indonesia. Thanks to Google, I managed to found Tian Jin Hai new location ever since they moved out from Jackson Centre Kopitiam. I called Kevin Yeo, the proprietor listed in Makansutra forum, and he was very friendly in answering my questions regarding the food in the restaurant. He told me that since mid-January 2008, they have moved to Punggol Marina Country Club, a place soooo secluded that no public transfer available. One can take taxi, or hop onto the hourly shuttle bus from Punggol MRT station. After confirming the address and made reservation to Kevin, Indi booked a car from the carsharing to go there. Joining us in the mission was the avocadolite family, having mandated to try the steamed shark by Cia, a faithful Bourdain follower. The road to Punggol Club after leaving Punggol Central area was unique, as the road was lined with thick blanket of tropical trees. It took us about 15 minutes to drive from Punggol Central area. Tian Jin Hai restaurant is located by the marina overlooking Punggol Island. Unlike many other seaside restaurant, this one doesn't face heavy traffic of freight ships and motorboat. It is quite pristine and the sea breeze is fresh. 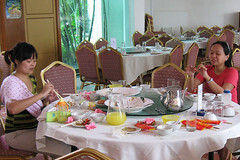 Kevin had prepared a table for six persons at the terrace of the restaurant, with easy access into the Marina. It was not too sunny, so it wasn't hot outside. When he asked for our order, we simply replied, "Just give us whatever Anthony Bourdain had!". He continued to share stories on the many times Bourdain had visited them, to the details of what he had ordered. Bourdain even followed the chef to Jurong Fish Market to see firsthand where the restaurant got the fresh supply. We decided to order medium sized shark head, steamed. This dish is what Bourdain had ordered and Chef Jeremy Leung had spoken highly of during the World Gourmet Summit. We also ordered pregnant crab bee hoon - crab cooked with rice vermicelli, a dish that has inspired Chef Justin Quek. Too bad the bar, which is not managed by Tian Jin Hai, has not opened yet, so we couldn't order Tiger Beer. While waiting for our orders to come, we walked along the marina to see boats (our obsession!). Indi came across an old Catamaran and spoke to the owner, Paul. Meanwhile, Thalia posed for photos with daughter Aina. A short while later, the pregnant crab bee hoon arrived. The first taste of the bee hoon has been quite orgasmic for Thalia, and soon I confirmed it. It seemed to be quite a simple dish. The seasonings and garnish were simple, complementing the natural flavor of the crab itself and the broth. I got the taste of the roe, and it was heavenly. 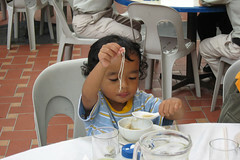 Noe couldn't seem to get enough of the beehoon and crab meat. I had to keep taking out the crab meat for Noe. Then came the steamed shark head. Actually it was not the full head but the upper jaw area, not including the eyes. Again, it looked simple. With minimal garnishing, the real taste of the chewy shark cartilage and fat were brought out out with a hint of soy-sesame oil-garlic-ginger taste. Thalia couldn't get enough of it and even gobbled up the hidden parts under the bone. I was curious to know if the shark eyes were included in this dish. 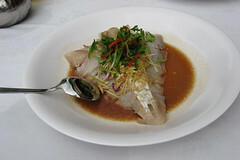 I love to eat fish eyes, and I bet shark eyes would taste good in this dish. Overall we are really satisfied. The food is good, the service is excellent, the atmosphere of the place is great. We would definitely come back to this place. Next time, we'll try the male chili crab, just like Bourdain had. What do you mean "a place soooo secluded that no public transfer available" ? that's an LRT line which is not in operation. you can try coming in by taxi but it will be costly. Love barbecued stingray with sambal though. My favorite makan spot for that dish in Singapore is a small stall at Lau Pa Sat; but some in East Coast Food Center or Newton Circus are nice as well. Shark head food is very delicious! Sea food dishes are always very tasty and its nice to hear that you have found out a nice restaurant for it. What a Great Article!